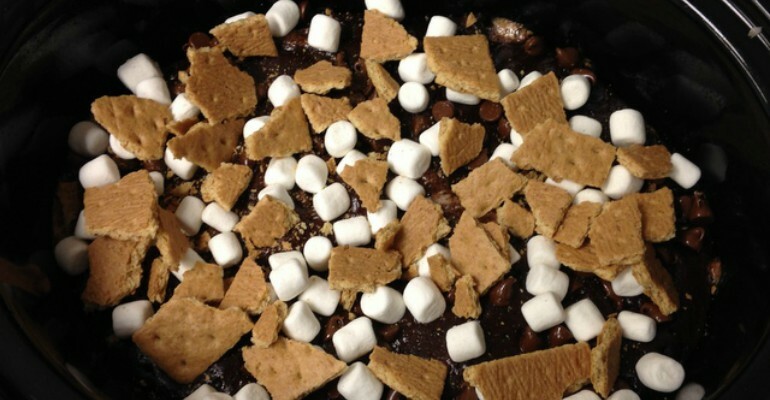 Campfire Crockpot S’mores Cake – Dump ‘er In And Wait For The Magic To Begin! Who cares if it is winter? Now, you can enjoy the sweet flavors of summer s’mores in your crockpot! Hey, everyone! I am so excited to tell you about this wonderful crockpot s’mores cake recipe that I found over on the Making Memories With Your Kids blog. Erin, the founder of the blog is a dessert genius! First off, let me tell you how much I LOVE making dump cakes. Dump cakes are the easiest desserts to make in the world. You literally just dump everything in a pan and bake. This recipe is EVEN EASIER because it is made in the crockpot! Before you know it you’ll have ooey gooey s’mores dump cake ready to go! My family and I love to eat ours warm and with a mound of vanilla ice cream on top. I bet you are just dying to know how to make this recipe, aren’t you? All you have to do is hop on over to the next page and you’ll see a complete list of ingredients and instructions. Happy cooking! Recipe and image courtesy of Making Memories With Your Kids. Quick Tip: this dump cake is best served warm and with lots of melty ice cream.